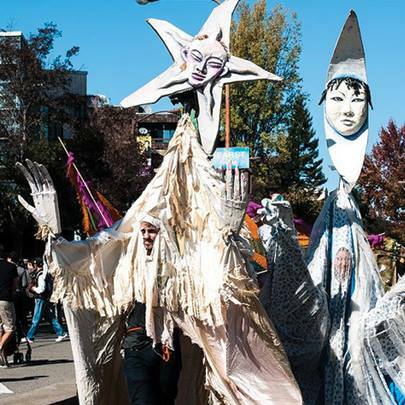 Check out some pictures from Sunday Streets on the Giant Puppets Save the World Facebook Page! Check out some pictures from Sunday Streets on the GPSW Facebook Page! We did it! The Giant Puppets Save the World parade with Habitot Children’s Museum delighted over 40,000 people at Sunday Streets! The giant puppets stopped to dance at six music stages along the seventeen blocks of closed road, inspiring joy and big smiles along the way. Thank you to all of our volunteer puppeteers, the Big Tadoo Puppet Crew, Habitot Children’s Museum, Livabale Berkeley, Sunday Streets, and everyone else that made this project possible!